Search.kimosachi.com is the website that shows you questionable content but it is not the main PUP you need to get rid of. To find all possible threats you should scan the computer with a proper tool. Search.kimosachi.com is the fake search engine that delivers questionable in-browser search results. Search.kimosachi.com is a PUP that changes the homepage of your browser and affects the speed of the computer with additional content. The Kimosachi search engine causes these redirects, intrusive advertisements and other changes on your Chrome, Safari or Firefox. In most cases, the program is installed on the system unwillingly, and the user is redirected to this fake search engine out of nowhere. However, it often gets frustrating because nothing on this website is working when you try to use it as a search engine. You cannot search for photos, videos or news or even read the Terms section. 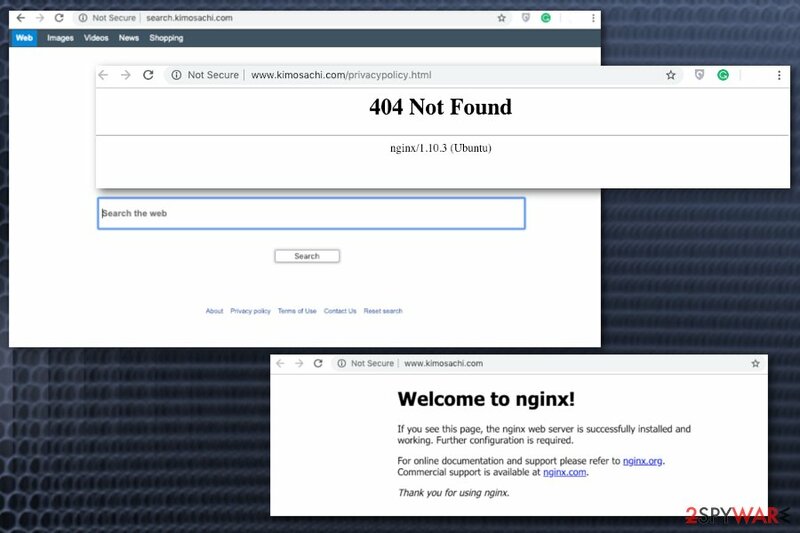 When you try to read more about this website you get redirected to a page that states about Nginx script that often also get called malicious due to unclear purposes. The only solution is to get rid of all related programs and setting your browser to Default. Usually, Search.kimosachi.com browser hijacker and similar programs come through advertisements or get bundled with ofter software. This is why people have no idea where these redirects and changes came from. Due to this silent infiltration, you may also notice additional browser content like extensions, add-ons or plugins installed without your permission. Track information about your online preferences. Although Search.kimosachi.com website might not work properly or provide you with any information or features, you need to get rid of the program immediately. For that, you should get a reputable program because the website is not the main intruder you need to delete. Get a tool like Reimage and scan the system to remove Search.kimosachi.com and the main PUP that is responsible for the intrusive behavior. A full system scan provides you with thorough results and suggests what applications you need to terminate. Since Search.kimosachi.com removal takes a few minutes, you can get back to browsing online normally immediately. However, experts advise checking your browsers directly and removing any suspicious content. We have a few tips regarding this step down below. Search.kimosachi.com is the potentially unwanted program that modifies various functions on your browser. Although there is a common belief that Apple devices are immune to cyber infections, there is an opportunity to get unwanted programs or even more severe mac malware. When you get software from questionable providers, online websites or p2p networks, you risk getting additional products during the wanted installation. You should make sure that every PUP or suspicious tool installed by the same browser hijacker is appropriately deleted. The only way you can do so is by employing an antivirus program suitable for the Mac operating system. Then a full system scan helps you with further Search.kimosachi.com removal. You shouldn't try to remove Search.kimosachi.com manually because it takes more time and you cannot find all related files or programs. This way browser hijacker remains running on the system. If you need a reputable program, check our suggestions. Wait until you see Applications folder and look for Search.kimosachi.com or any other suspicious programs on it. Now right click on every of such entries and select Move to Trash. Here, select Search.kimosachi.com and other questionable plugins. Click Remove to delete these entries. Now you will see Reset Firefox to its default state message with Reset Firefox button. Click this button for several times and complete Search.kimosachi.com removal. Here, select Search.kimosachi.com and other malicious plugins and select trash icon to delete these entries. Click Reset to confirm this action and complete Search.kimosachi.com removal. Here, select Extensions and look for Search.kimosachi.com or other suspicious entries. Click on the Uninstall button to get rid each of them. Here, look at the Homepage field. If it was altered by Search.kimosachi.com, remove unwanted link and enter the one that you want to use for your searches. Remember to include the "http://" before typing in the address of the page. Now you will see a detailed dialog window filled with reset options. All of those options are usually checked, but you can specify which of them you want to reset. 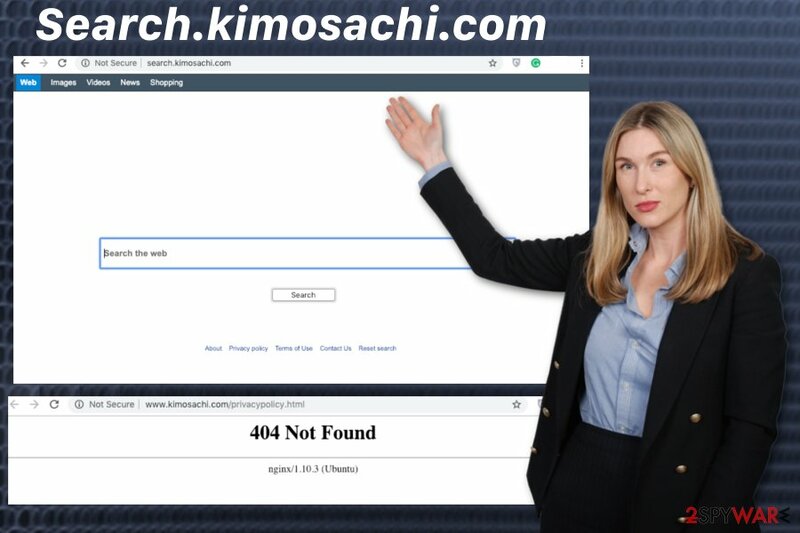 Click the Reset button to complete Search.kimosachi.com removal process. ^ Dennis Anon. How cookies track you around the web and how to stop them. Privacy. Education on privacy and security online. ^ Error 404. Wikipedia. The free encyclopedia. ^ Lily Hay Newman. Malware has a new way to hide on your Mac. Wired. Science and technology news. This entry was posted on 2019-01-30 at 04:12 and is filed under Browser Hijackers, Mac Viruses, Viruses. You can quickly scan the QR code with your mobile device and have Search.kimosachi.com manual removal instructions right in your pocket. 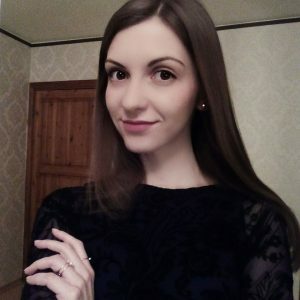 How did you remove Search.kimosachi.com?